the engineer's other life: Some sewing! I have been thinking about this BurdaStyle top (06-2010-120) for literally a year. I don't know why I didn't make it earlier - a lack of use for frilly one-shouldered tops, perhaps? Hahahahaha! 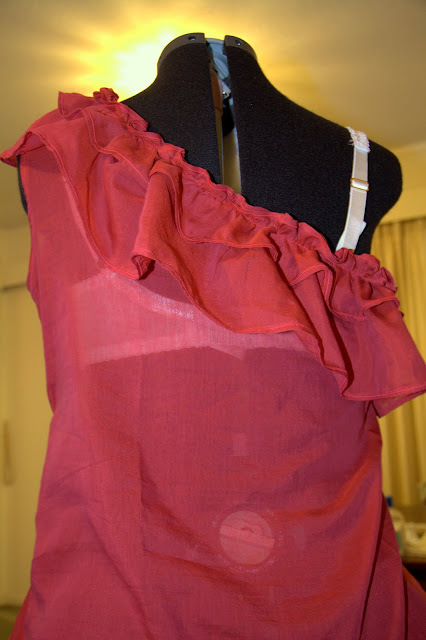 One-shouldered blouse for woven fabric - with ruffles and a side zip. I think so - it's a fairly simple pattern. 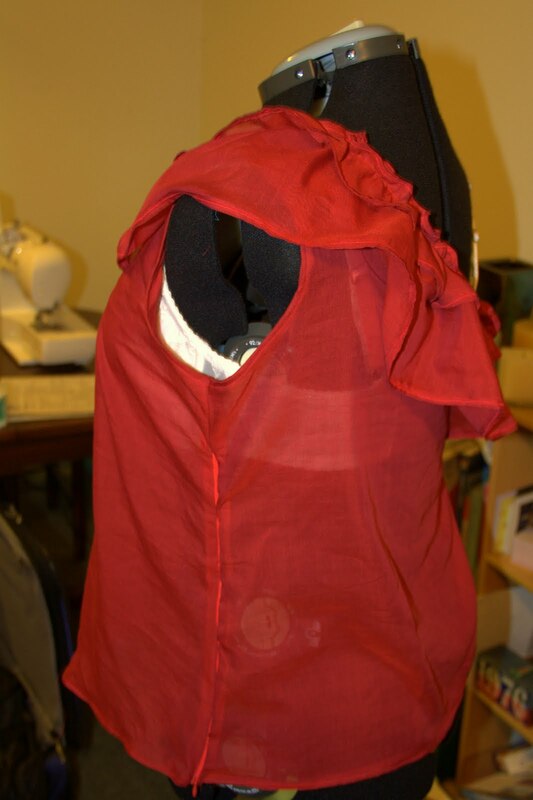 Though they do neglect to mention sewing the front darts... if you're wondering, do it first! Before you sew anything else. I liked the breeziness, and the youthful style (even though I'm not feeling that youthful right now!). Plus it's not something I've seen in shops here. I'm not a huge fan of the zip, as I find side zips are often scratchy (sensitive skin). I would have omitted it as some others did, but I wouldn't have been able to pull the top over my chest (even though the top is loose). I made some modifications as well. The most lightweight silk/cotton woven I could ever imagine. Apparently it's 80% silk. I can say that washing it in hot water and steam ironing it has done no damage, despite the apparent delicacy. If I had used a woven with a little stretch, I could have omitted the zip (live and learn, I guess). Woo, altering this was a learning experience. Firstly, I completely left out the elastic at the bottom. I really don't need that kind of poofiness at the hips! That was an easy adjustment. Secondly, even though it's loose, a top can NEVER have enough ease for my chest (apparently). So I chose to look at this as a learning experience for FBAs. It probably wasn't the best top to try it on, as the darts are vertical. On the other hand, they are hidden by the ruffle, which could have been a saviour. An adjustment I *should* have made, would have been to lengthen. Just by a couple of inches. 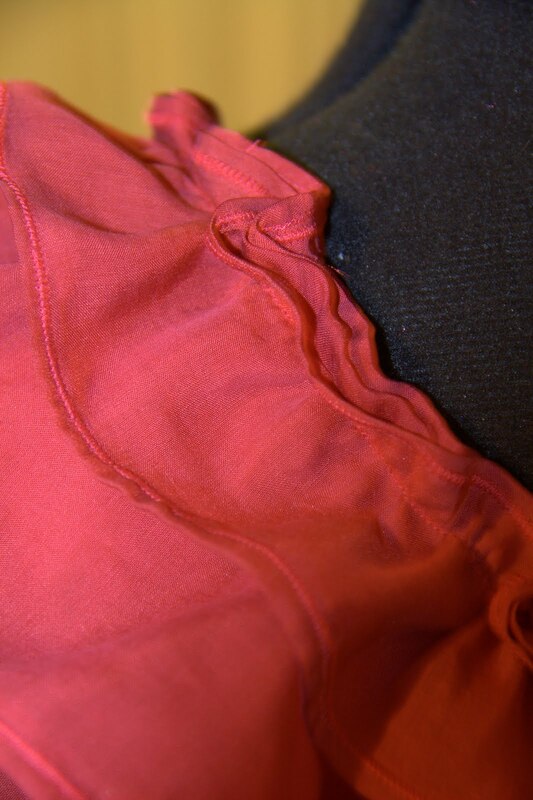 As I did the FBA and left out the elastic, the length is still wearable though. 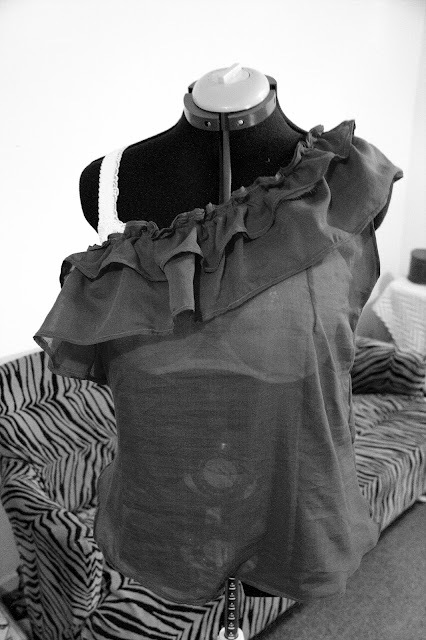 I wouldn't sew it again - one frilly top is plenty! But if it is a style you like, the pattern is a good one. I'd recommend that you choose a size based on your waist size if you have a large bust, and doing an FBA, even though the style is floaty. If you size it too large, the opening at the top will gape! It's a cute top, and I learned a lot by fussing around with adjustments. It's given me some confidence to properly adjust the sizing on more complex designs. This top is very summery... it may even come on holidays with me next week - woohoo! This will be a very pretty vacation top. I love the shade of red! Thank you! The close-up picture is the most similar to the real colour. 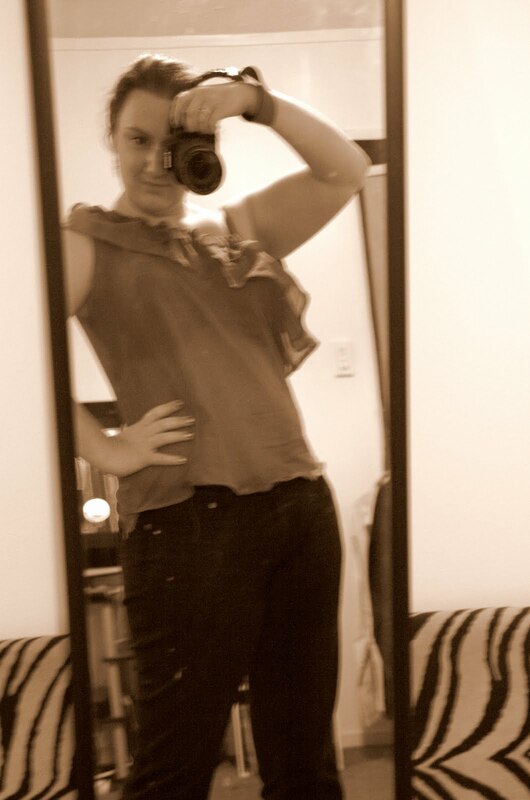 It's kind of sheer, but with a swimsuit underneath, I think it will work. Looking forward to the sunshine!